Can colors actually improve your performance? 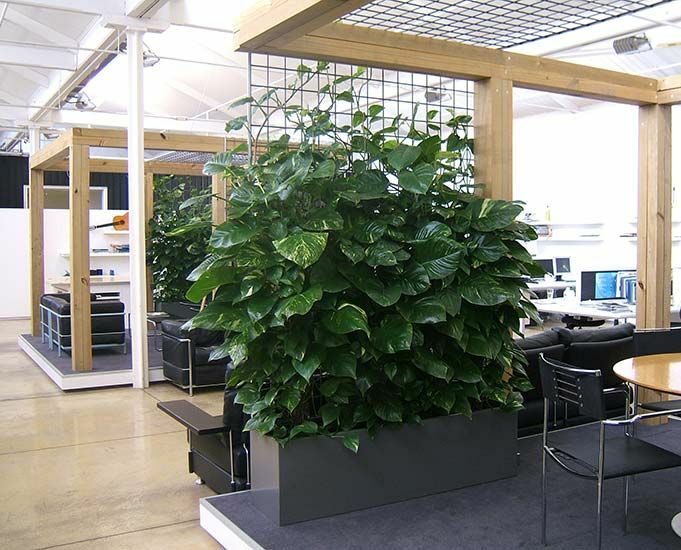 In my last blog article I mentioned that the presence of potted plants in offices improves productivity, creativity, performance and learning ability. One of the reasons given was that plants and trees act as vacuum cleaners, absorbing the indoor pollutants that have been linked to anxiety, depression, irritability, fatigue and cognitive decline. But that’s not the whole answer. If it were, why is it that that people with windows facing the outside world are more productive, healthier, and maintain a higher level of concentration than people with windowless offices? And why did researchers find that the more green space that residents can see out their windows, the less aggression and violence they reported at home? And why did researchers find that university students with mostly natural views from their dormitory windows score better on tests of working memory and concentration than college students who lived in the same dorm but with views of other buildings? We have a definite link with nature, and the human brain is influenced by our environment – what we see, smell, hear and feel. The book, How the body knows its mind, by Sion Beilock reported that city dwellers are at a 20% increase risk for developing anxiety disorders and a 40% increased risk for mood disorders compared with people who live in less populated areas. And in the book, Your brain on nature, by Selhub and Logan, the authors state that research has shown that emotions of pleasure and happiness are elevated with an increase of tree density – even in urban settings. It’s more than simply pollution at play. Japanese researchers have noted increases in the number of natural killer cells and increases in the amount of intracellular anticancer proteins after spending time in a forest. And natural chemicals secreted by evergreen trees have been associated with improvements in the activity of the frontline immune defenders. And what about the impact of the various colors on our mood and performance? Is it a coincidence that blue and green – the colors most frequently found in nature – have also been found to be the most effective in stimulating personal productivity? Selhub and Logan point out in their book that recent studies show that the blue portion of the light spectrum stimulates the areas of the brain that involve attention and memory. Blue enriched light has been shown to improve mood, performance, alertness, irritability and evening fatigue. Blue is known as an excellent color for productivity as well as having a calming effect on employees. It stimulates the mind and increases productivity. Ravi Mehta, an assistant professor at the University of Illinois, believes that a blue background screen on your computer also improves performance when working on a creative tasks, while a red background is better with more detailed oriented tasks. Green has also been associated with calm and well-being. One study found that 95% of the university students questioned associated the colour with positive emotions. Deep greens can excite and motivate staff. Melanie Feltham, social media community manager at Upwork, claims we feel at ease in blue and green rooms because of their relationship to nature. You may want to experiment with colors. A national survey of 1000 office workers found blue to be their preferred hue. One researcher suggested a mixture of blue-green with accents of motivating soft red. Some workers are more productive in rooms painted in bright colors while others find it overwhelming. It has been suggested that you use a lighter color on your desk since reducing the amount of contrast between your computer screen and desk will reduce eyestrain. Alternatively, you could use a large blotter or desk calendar. Avoid beige or white. A University of Texas study found that grey, beige or white offices induced feelings of sadness and depression – especially in women. Yellow can give you a burst of energy; but it can cause irritability and induce fatigue faster. Red tends to increase heart rate and blood pressure and should probably be used only to draw attention to something – like stop signs, fire hydrants or fire engines. It would appear that sticking to the colors found in nature – blue skies, blue water, green trees, green grass and fields – is the best choice for efficiency, focus and a lower stress level. It’s hard to improve on nature. Improving performance with office greenery. We are all aware of the benefits of walking; but it has been shown that a 40 minute walk in a forest results in lower levels of the stress hormone cortisol then an equivalent walk in the laboratory – plus improved mood and feelings of vigour. It also lowers blood pressure, and improves sleep. There is little doubt that trees, plants, grass and other vegetation affects us both physically and mentally. In order to increase performance of students and workers alike, Ratey and Manning, in their book Go wild, recommend designing buildings with greenways, open space, landscaping and potted plants. And as reported in an issue of Scientific American Mind (January February, 2015), even staring at pictures of outdoor scenes has been linked to pain relief, stress recovery and mood improvement. A more recent issue of Scientific American Mind (May June, 2016), linked exposure to natural settings with many health benefits, from reduced rates of depression to increased immune functioning. For example, patients in hospital rooms with a window view require less pain medication and spend less time in the hospital. Recent studies found that urban green spaces, such as plants and gardens, also improve cognitive development. An old clipping on the environment that I found buried in my files from some 20 years ago, and attributed to the National Wildlife Foundation, claimed that one large sugar maple can remove as much airborne lead as the city’s cars emit by burning 1000 gallons of gasoline. City planners in Los Angeles had said that by the year 2000, trees would remove some 200 tons of dust and smoke from the region’s air each day. I have no way of checking the accuracy of that prediction; but one article I came across recently states that according to the U.S. Forest Service, the trees around the world removed about one third of fossil fuel emissions annually between 1990 and 2007. Mounting research suggests that city living is not conducive to mental or physical health. A July, 2012 issue of chatelaine.com suggested we’re more disconnected with nature than ever – exchanging outdoor activities for playing video games or using social media indoors. An item in the March 17, 2016 issue of telegraphJournal.com reported that on a global scale, it is estimated that the transportation sector is responsible for approximately 5.8 million deaths per year: 3.2 million from physical inactivity; 1.3 million from vehicle related collisions; and 1.3 million from outdoor pollution. And a string of studies from all over the world suggest that common air pollutants such as black carbon, particulate matter and ozone can negatively affect vocabulary, reaction times, and even overall intelligence, according to a report in the November/December, 2009 issue of Scientific American Mind. In an older blog article I talked about my decision to move my office to the condo’s solarium, add plenty of greenery on the balcony visible from my desk, take advantage of natural lighting, and even hang a picture or two of scenery. I did find an improvement in my overall mood and productivity, although that was an extremely subjective observation. There are other things I could have done as well, which I will mention in my next blog. But last month I went the extra mile – or more accurately 1500 miles – and moved to Sussex, New Brunswick. Thanks to the digital world in which we live, the move (from a business viewpoint) was seamless. And after almost a lifetime spent in the city of Toronto, I expect the impact on my well-being and productivity to be quite significant. I’ll report my findings in a few months. In the meantime, I will continue to review some other suggestions for improving productivity without having to move to the country. Next blog article: Can colours actually improve your performance? In past blogs I reviewed the impact of environmental factors such as noise level, lighting, office decor, colours and greenery on productivity and creativity. It’s also important to have an organized office to minimize distractions, boost efficiency, lower stress, conserve energy and increase personal comfort while working on your priority tasks. Choose an adjustable chair that allows you to rest your feet on the floor while maintaining your eyes at about 30 inches from the computer screen with the top part of the monitor slightly below eye level. You may need a cushion to support your lower back as well. 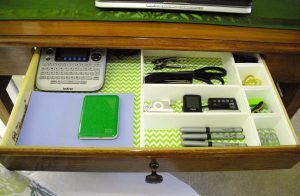 Organize your desk and surrounding area so that frequently used materials and supplies and equipment are within reach. The less frequently you use materials, the farther away they should be stored. For example, your stapler, paper clips, writing materials might be on your desk. An organizer tray in your most accessible drawer could contain such items as elastic bands, sticky notes, scissors, tape, batteries and staples. Another drawer could contain envelopes, stamps, return address labels, forms, invoices, and so on. If you frequently refer to hardcopy files, house them in hanging folders in your desk’s filing drawer or a freestanding filing cabinet within reach. Action files such as next week’s meeting material, invoices to be paid, information for an article being written or items to be reviewed can be held in a vertical step file device on your desk. But otherwise keep your desk as clear as possible to accommodate your current project. Whenever possible, store your supplies where they are used – printer paper, ink cartridges etc. near the printer, copier supplies near the copier and so on. These organizing principles apply to your digital files and forms as well. Have frequently used documents such as your weekly blog articles, tweets, monthly reports etc. in a folder on your desktop. Avoid having to click through five or six levels of document folders every day or week to reach the materials you need. Less frequently used files can be several levels down in your main “Documents” folder. For instance, you might have to click through Associations, NAPO, Conferences, and Exhibits each year to reach the Product List file. Don’t allow your computer desktop to be cluttered with folders and individual documents. File newly created documents in the proper folder as you create them. Temporary storage easily becomes more permanent and slows the retrieval process. Have a bookcase within reach for more current books that you refer to frequently for research while writing articles, writing proposals for clients or developing training programs. Once they are referred to less frequently and replaced by more current books, move them to your larger bookcases farther from your immediate working area. Try to keep books on the same or similar topics together. Choose categories that suits your particular situation. I have categories such as general management, time management and organization, brain, ADHD, etc. I affix a coloured self-adhesive label to the lower part of the spine – a different colour for each category. If you do this at the time you buy the book, it takes only a few seconds. This allows you to place the book on the correct shelf to keep the topics together. You can also quickly spot a book that has been misfiled or moved. Remove all clutter and other potential distractions from your immediate work area – including the in-basket if you have one on your desk. Hopefully you have already decided what you will be working on each day and don’t need additional distractions. Any in-basket should be outside your office or at least as close as possible to the doorway. If it’s a crisis, it won’t need an in-basket anyway. Don’t have family photos or memorabilia in your line of sight. These could initiate the brain’s impromptu trip down memory lane. A window view is okay as long as it’s a view of nature and not a school playground. Although it seems I am trying to glue you to your desk for the day in the name of efficiency, read this in context with my previous blog articles. Remember the standing desk, 90-minute works sessions, frequent breaks, walking sessions and stand-up meetings. You don’t want to remain sitting; but you do want to remain productive during those 90-minute work sessions. In the next article I will suggest how you might increase your productivity even more by managing the way you work. Next blog article: Get maximum results with minimum effort.